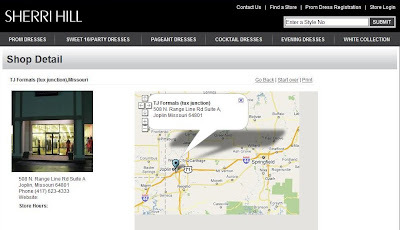 TJ Formal Dress Blog: Ask TJFormal: Are your dresses originals or knock-offs? Ask TJFormal: Are your dresses originals or knock-offs? Q: Are your dresses originals or knock-offs? Sadly, there are many websites that sell copies of designers' dresses. They see the dress, then recreate it with their own fabric and patterns. For a cheaper price. This is an illegal practice and as designers find out about these sites and companies, they most times can get them shut down for the theft of their designs. Here at TJFormal, EVERY dress and product on our site is an original. We are an authorized retailer for every brand we sell here! And we only sell new, authentic items that come straight from the manufacturer, so you can rest assured that you are receiving genuine merchandise. 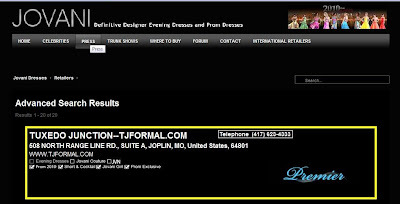 Look for our retail store (Tuxedo Junction) or our website (tjformal.com) to be listed on our designers' websites. You can also sometimes search by state (Missouri) or zip code (64801). Here are some examples! Ohhh, very good advice! I always wonder about some of those sites out there... many seem sketchy. I agree with the comment above!